What’s In Your Hunting Pack? In two days, a couple buddies and I are heading to Pike County for a four-day bowhunting trip… No, not THAT Pike County, but it’s close. In fact, it’s right across the river from it. Both my pals are fairly novice bowhunters, and this is the first full season for one of them. Seeing as how I’ve been on several 10-day, DIY excursions to Colorado chasing my beloved wapiti, they’re leaning on me heavily to provide guidance as to what to bring. 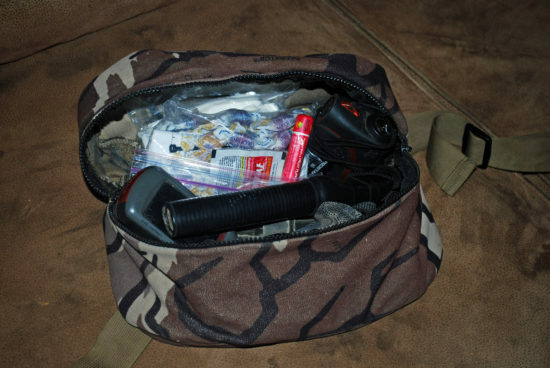 It’s actually not that uncommon a question from even veteran bowyers, as I see the “What’s In Your Bag?” query on the bowhunting forums quite often. After well over a couple decades’ worth of bowhunting, with most of that time consisting of over 100 stand sits annually, I’ve definitely settled on a list of “must-haves” as well as items that have found their way into and out of my fanny pack. I’ll break down below exactly what I carry with me, and the use for each item. A small Ziploc bag (for weather protection) holding a good amount of toilet paper, plus hunting licenses. Also included in this bag are small zip ties for affixing the licenses to the deer’s back legs, a tube of chapstick (seems my lips are prone to drying out on windy days while on stand), and a handful of cherry cough drops (nothing worse than getting that tickle in your throat when you’re set up within 100 yards of that big buck’s bedding area!). I also put a nice lensatic compass in the bag, to keep the glass lens from getting scratched all up by the other items in my pack. I’ll give you a tip about the toilet paper before moving on… I carry quite a bit of it with me, and obviously you probably realize one of its primary purposes. But I also lean on it just as heavily when tracking a deer at night by propane lantern. I tear off little half-squares and place every couple feet along the blood trail I’m unwinding… it’s remarkable how you can hold up your lantern and see those white squares trailing off into the blackness, and they’ll really help you get a “line” on the direction the deer’s traveling and where to look for next blood if you’re having difficulties. An added bonus is that when you’re done, you don’t have to go back and retrieve all of them — just let the next rain dissolve all of them for you. A mini-mag flashlight… the triple-battery version. I often end up in hairy places after dark I’ve never been through before, and I like to see what I’m trying to wade through – be it thorn bushes or a small creek. The version I like to carry just fits into my fanny pack from end to end, and utilizes three “AA” batteries. A headlamp. Sometimes, I’ll opt to turn my cap around backwards and slap on the headlamp. It’s especially helpful when I’m assembling my stand at the bottom of my tree after I get down in the pitch black, or when I’m gutting a deer after dark. A Leatherman multipurpose tool, the small kind. It contains a three-inch knife blade that I’ve used to gut over 50 deer, antelope and elk with. And on the off chance I need a pair of pliers, they’re included too. Limb saw… to trim shooting lanes with, and more importantly to cut off small branches on the tree I’m going up with my climber. My pull-up rope. I bought a commercial one with the plastic swiveling ends and hooks on it, cut those off and attached those to 30’ of parachute cord. Packs much tighter than the commercial one I bought. 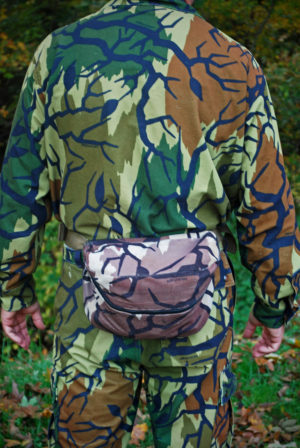 Rattle bag. I’ve got a very nice set of real rattling antlers that sound awesome, but they’re a pain to carry all the time. My rattle bag fits nicely inside my pack and is always there from the third week of October until December. Bleat can. I can’t attribute any single deer to coming in to the can call, but I’ll mix it into my rattling sequences any way; the hope is it’ll sound like the estrus doe that the two bucks are fighting over. True Talker grunt tube. This has accounted for more deer riding home with me than any other single piece of equipment. Ninety percent of the time, my shot opportunities are limited by heavy undergrowth and are 30 yards or less. Every once in a while though, I’ll sit a field edge where the rangefinder comes in handy. Diaphragm turkey call in a clear case. Archery deer tags come with two turkey tags included, and I won’t pass up an opportunity to call to a passing flock. I’ve got a wall-full of turkey fans above my desk that were all taken with my bow in deer season. Extra release. In case I leave my main one at the truck or it falls out of the tree for some reason. Four bow hooks. My bow goes on one above my left shoulder, and my fanny pack hangs from one around seat height on the same side of the tree. The other two are spares. A Kwikee Quiver caddy with my Octane quiver holder attached. I screw this into the left side of the tree, and affix my quiver upside-down so if I shoot and need to reload quickly, I simply reach behind me without looking and pull another arrow out. A hand-held Magellan GPS. This is a recently new addition to my pack, and one that I’ve come to value. I shoot a lot of deer just before dark as evening hunts comprise 98% of my trips afield (I’m just not a morning person). Usually, by the time I recover the deer and head back to my vehicle to get my game cart, it’s pitch black once I return to the scene of the crime. Having marked where my deer is laying via the GPS sure does make it a whole lot easier once everything looks completely different in the dark – and a whole lot easier to get out of the woods. You could ask me any day of the year, and that’s what I’ll have in my fanny pack. It’s the main component of a system that I’ve fine-tuned for over 20 years of bowhunting, and it’s what enables me to grab my gear extremely quickly when I get home and be on my way to the woods in just a few minutes. I’m never scrambling around looking for this item or that; I simply know exactly where everything I need is.